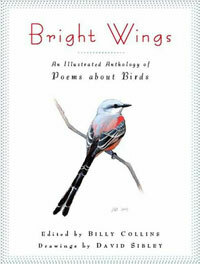 Billy Collins and painter David Allen Sibley make a beautiful book of poems, Bright Wings. Former U.S. Poet Laureate Billy Collins has collaborated with ornithological illustrator par excellence David Allen Sibley to create a sweet little compendium, Bright Wings: An Illustrated Anthology of Poems About Birds (Columbia University Press), which is, as the title claims, over a hundred poems illustrated with 60 Sibley’s precise watercolor paintings. The complete poem is available here. And as is in evidence in this tome’s wide spectrum of image and metaphor, there is for poets something liberating and inspired as they behold nature’s winged creatures.